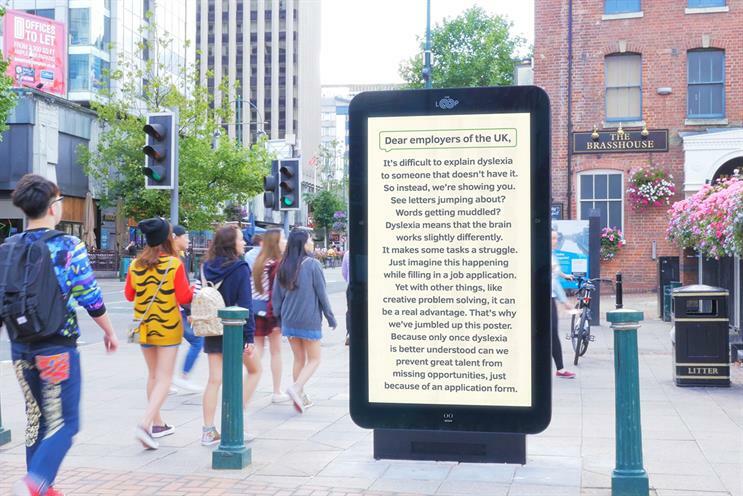 Leo Burnett London is using out-of-home tech to show what it's like to have dyslexia. The ad, "A moment of dyslexia", uses facial facial-detection technology on Ocean’s digital out of home screens. The longer people look at the screens, the more jumbled the words and letters become, reflecting what it can be like to be dyslexic. The campaign for the British Dyslexia Association is a winner in the digital creative competition run by Ocean in partnership with Campaign, which celebrates ideas that push the boundaries in digital out of home. Winning campaigns are brought to life with Ocean’s help and given free media space. Leo Burnett London created dynamic long form copy for the screens which is triggered by Look Out, Ocean’s audience detection technology. This can measure audience attention time as people stop to read the text. Lewis Beaton, creative at Leo Burnett, said: "The BDA and Ocean have both been fantastic to work with. We’re excited to see the work go live and hopeful that we can make people think differently, and nudge employers to find ways to make their workplaces more dyslexia friendly." Margaret Malpas, vice-president of the British Dyslexia Association said: "Providing an experience of visual distraction, which affects many dyslexic people, can transform peoples’ appreciation of what it means to be dyslexic. An awareness of how to make simple adjustments can make a real difference to the workplace. Many dyslexic adults find digital application forms that time out are a real problem, but wouldn’t it be better for everyone if they didn’t do that? With an appreciation of the difficulties 1:10 staff face, it’s fairly easy to provide a dyslexia friendly environment that benefits everyone." Ocean head of marketing Helen Haines added: "This simple campaign captures perfectly the dynamic capability of digital out of home and how DOOH screens can respond to and engage with people in the moment. On this occasion, the combination of technology and location with long form copy which you don’t normally find on large format screens demonstrates the power of the right message in the right place at the right time." The 2018 digitial creative compettion is now open for entries.